Fidelity Investments (www.fidelity.com) is a privately held financial services company based in the United States. Services include trading, mutual funds and retirement planning. Revenues in 2014 were reported as US 14 billion and operating income as US 3.4 billion. There are over 41,000 employees in the Fidelity company. If you have a problem with your account at Fidelity you may call 1-800-343-3548 or you may find their service overview here. If you wish to mail a postal letter to CEO, Abigail Johnson you may address your correspondence to 200 Seaport Blvd., Boston, MA 02210. The corporate office phone number is 617-563-7000. The current slogan of Fidelity is ‘every someday needs a plan’. Founded in 1946 by Edward C. Johnson III the company has social media presence on Facebook, Twitter, Linkedin, Google+ and YouTube. Are you aware that your employee in Lincoln, California sends messages like this? (See image and URL below.) 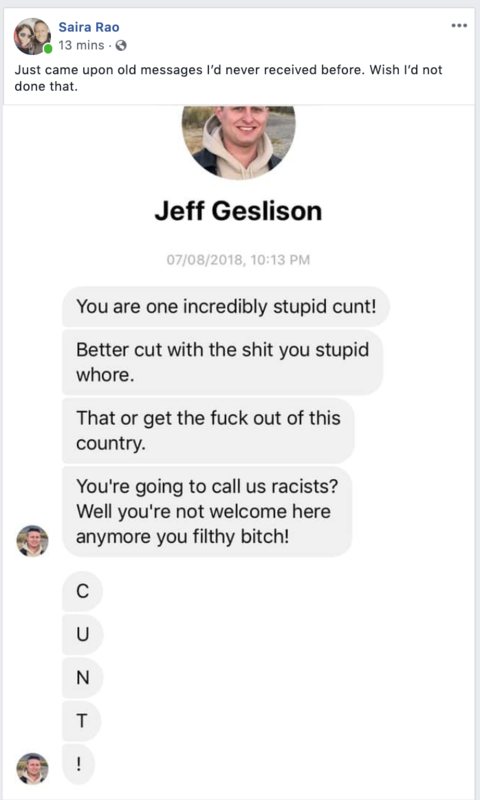 He is harassing Saira Rao, an attorney and publisher who ran for Congress in Colorado last year. She speaks openly about the racism and misogyny she encountered as a woman of color. Does Jeff Geslison represent your corporate culture? Is this the kind of person you want representing Fidelity to customers and investors? I have been trading options for 15 years and Fidelity would not turn on options trading ability for me. when i ask why, they give no reason other than "they can approve me" . I asked many times, "for what reason am i not able to trade options from my account?" and get same generic response of "we cannot approve your account for options trading"
keep in mind, I am only asking to the ability to BUY options on my account, not margin or anything like that. BUYING an option is no different than buying a stock in terms of risk, the most you can lose on either is your original purchase cost. Funny thing is, i am approved to buy stocks but not options, which is 100% illogical and they wont explain why i can do stock purchases but not options. In the last two weeks I have tried to contact a representative on 5 different occasions to no avail. I was put on hold for over 20 minutes each time. never did get to talk to a representative. Worst customer service anywhere. Seriously thinking of taking my accounts elsewhere. On December 31, 2018, I received my last check for the year which was 65% less that it was supposed to be. Two weeks prior, I signed up for a 401K plan and elected 1% of my check to be deducted, which amounted to $25.62 per pay period, per your website. When I received my final check for the year, the amount was 65% less than it was supposed to be. That is $1459.00 that was deducted when it wasn’t supposed to be. On December 31, 2018, I called Fidelity to question the huge deduction. They stated that with the holidays I would have to call be on 01/02/2019. So, on January 2, 2019, I called and explained to them the amount that was deducted from my check was not authorized and asked what I needed to do to receive my refund. I immediately changed by deductions to $0. They opened a case on 01/02/2019 and advised they would have to do an investigation to see if it was an error with your website. I gave them all the information and called on a daily basis at first, then I started calling weekly. 6-8 weeks later, I was calling as much as I could to get an answer of when to expect my refund. I was told that I should have received a confirmation email stating the elections that I chose. Needless to say, I did not, or it would have been changed at that second. I have spoken to several of my co-workers who have updated/changed their elections and to no surprise, they have never received a confirmation email either. Finally, I received a call stating that their findings did not show an issue with the website and that my elections were correct. Absolutely not surprised, I asked what I needed to do or what the next step would be. I spoke to Katie on 02/10/2019, and then Marissa, who I spoke to on 02/12/2019, advised me to file a complaint, fax it to them and mail a hard copy as well. On 02/12/2019, I faxed a copy and mailed a copy to the address I was given. Now, we are into 9-10 weeks of me not getting a refund for 2 weeks of work, I finally received letter in the mail on 03/09/2019, stating that they agreed with the findings of the original report and the deductions were correct. I expected nothing less. I am not concerned nor shocked that the results are in your favor, but I am upset about the fact that I worked 2 weeks with no pay. Of course, unless I quit my job or wait until I turn 65, then I can get my money back. I don’t understand why this is such an ordeal. I know what elections I chose, and I know that your investigation will always be in your favor. If the error was on your website and there wasn’t enough money taken out, I guarantee that you would deduct it out of the next check. Since, this was not an error on my part, despite whatever your IT team says, I expect my refund to be sent to me immediately. It is ridiculous that I have been fighting for money that I worked for and you had no right to take since December 31, 2018. The time frame alone is unacceptable. Argosy University is bankrupt because of Dream Center Holdings stealing money from students. Now, they are not paying faculty and staff. Fidelity will not believe faculty and staff a terminated unless they have a payroll, I am caught in this endless loop of non action and need to pay for my mother's co-pay for a rehab unit and my bills. Will I have to declare bankruptcy and endanger my mother because I cannot get this situation resolved. By the way, faculty and staff had there email turned off before the message came out about the missing payroll, When I called Fidelity about this situation I got "you have to wait 1-2 payrolls before..." If there is to be no payroll what can be done? How long can Fidelity keep someone's money in this type of situation? My children have 401k beneficiary accounts with fidelity after losing their father 2 years ago. I was asked by fidelity (after 5 phone calls over a 3 month period of time with different people and answers each time) to submit court documents to prove conservatorship since they are minors in order to have access to their accounts. After being advised by my financial advisor and the estate attorney that the accounts needed to be distributed within 5 years of death into their restricted account (called out in the court document), I contacted fidelity to start that process. I was told that the funds are to be kept within the fidelity accounts in accordance to the court documents and nothing can be done without another court document requesting release of the documents. Keep in mind, all of this information was given after several "hold" times as the person had to ask what to do. The answer is wrong--the court document says all assets need to be put into the restricted account (what I am trying to do)--of which the fideltiy account is NOT the restricted account. However, I was not allowed to speak to anyone else. I was told the legal department (who made the decision) does not take calls, and the supervisor (who was giving advice behind the representative) did not take direct calls. The representative did not try to understand the situation--only put me on hold and repeat what she was told. She also told me I don't have to have the funds distributed within 5 years--you can imagine my hesitancy of believing her over an estate attorney and financial advisor given the conversation so far, and also being told differently by your own company during a previous call. So, your company has unqualified people, who have no information, relaying inaccurate information that impacts people's lives with absolutely no accountability. I am now going to have to pay lawyer fees and court fees to educate your people and fix a mistake you made and there appears to be nobody who cares or who is willing to take accountability. The mistakes are growing--you incorrectly applied a court document, you misspelled my son's name (which you won't correct without a written document), you gave inaccurate information and your representaves and supervisors don't care enough to question, investigate for fix your mistakes that impact your customers--that is all placed on your customers, as well as the consequences of your actions. You have made a horrible situation (the death of their father) so much worse. I will be sure to educate all of my customers and friends of the service I have received and advise them to look elsewhere for financial programs and policies both individually and for their employees. I have the opportunity to help companies look at their benefits and providers, so this will be quite helpful to prevent others from having to deal with such incompetent and uncaring service. My wife is trying to work with fidelity for about a month after her fathers passing. He has an account with $700k+ in it and she is listed as POA. She has worked with ISG, the dept supposedly doing this. After sending many, many forms, some notarized from her and her brother, making a 5hr (oneway ) trip to Fidelity office, we are hearing nothing back, just voicemail. They say they have been calling but no calls listed on 4 phones. He has 2 trusts, 1 listed with Fidelity specifying his wishes and they are not honoring POAs that allow her access so she can pay her mothers medical bills. Her mothers in in a memory care unit and unable to handle her affairs. Another person appeared, Ryan Lorence and does not return calls. Your Palm Beach Gardens office never answers the phone. When you walk in there is someone at the greeting desk. Why can’t they pick up calls and take messages. If you go to your 800 number, you wait at least twenty minutes anytime, any day for someone to pick up who is helpless and transfers you so you can wait another ten to twenty minutes. That is why your customer service is rated one star in the web. At least you haven’t exported it like Dell or Xfinity which are rated lower. You have gotten so large that customer service is no longer a corporate priority. Fidelity consistently proves to be non-caring of its customers and unaware of the tax implications of closing a 401K plan. After following their customer services instruction, completing all the forms, including one that limits the withholding tax, they still managed to get it wrong. Like many other complainants, after several months of inquiries, a formal complaint issued and support from the company 401K plan administrator, Fidelity still stands by their position that the withholding tax was correct and was not willing to make any restoration for withholding double the amount of tax than they should have. Even after I provided Fidelity the tax treaty, with completed forms and the Treasury Board Regulation that covers the reduction in withholding tax, Fidelity still insisted that their interpretation was correct and refused to make any correction. These are typical approaches and tactics of large financial intuitions and insurance companies, who have unlimited resources, to never admit they made a mistake and wait out the little guy, till he goes away. I find it unbelievable that a large financial institution with almost unlimited resources, that is responsible for billions of dollars of customer’s money, has such poor knowledge of the tax codes and little regard for their customers and their money. If I owned a company and had chosen to trust the employee’s pensions (401K) to Fidelity and learned how Fidelity treats the employees and cares for the employees’ retirement funds, I would surely move the plan to another institution. Fidelity obviously doesn’t have a working, certified quality system as demonstrated by poor customer service, lack of knowledge of the tax codes and the lack of a customer friendly complaints mechanism. Fidelity does not seem to welcome any feedback, positive or negative from customers. Fidelity would rather coverup a mistake then correct it. Anyone dealing with Fidelity should review their arrangements to determine if Fidelity is the type of company that they should continue to do business with. Fidelity has peoples’ futures in their hands and they have shown time and time again that the only thing they are worried about is their profits and not the people. I been trying to disable 2 step authentication for 3 days. I've spent hours on the phone with Fidelity agents. The process to disable the 2 step authorization requires a code to be sent to your phone. but I wasn't receiving a phone call with a code which is why I wanted to disable that feature. There were times during the process of helping resolve this issue, when I was given the choice of getting the code through my email, but that option isn't available to disable the 2 step process. Fidelity is blocking access to my account by this process and is not offering a work around. I have a trust, I am suppose to have someone named nahida a. as contact. she never answers email, and I have a new bank account to give her. I have no ph no and also where is she? My doctor says I need a simple surgery to fix a problem with my toes, otherwise I could get an infection and therefore lose my toe, my foot, or my leg. I don't have the money for this surgery and my insurance says they wont cover it unless I pay $1,000 up front plus 20% of the bill. I don't have that kind of money, I BARELY pay rent as it is. It's bad enough they take money out of my pay for this idiotic 401K, and now that I NEED money for foot surgery, I can't even get any of MY OWN MONEY from MY OWN ACCOUNT!!! They want to give me a LOAN (!!! ), which I can't afford because I make a low wage as it is, and having all these medical deductions for insurance is a huge strain on my pay in the first place!!!! Now I'm at risk of getting infection in my foot, losing my toe, my foot, or my leg because they REFUSE to give me some of MY MONEY! I have double the amount in my account that I need, so it's not like I need all of it! Seems to me this set up is nothing but an elaborate SCAM to bilk people out of their own money! They don't have any problem TAKING your money, but when you NEED it for a possible life-threatening medical surgery, YOU CAN'T HAVE IT!!!! I have been attempting to have a sit down as of 7/24/18, with my money manager. I am going to be 70 this year and wanted to take the steps for my future retirement. After being a good customer for 35 years with Fidelity , I though it would be easy to get an appointment, NOT the case. I know I'm not a big investor (400K), but not a very happy investor right now. I don't want to hear any more music on YOUR answering services. When I was still working, the company I was working for was going through a slowdown, jobs were being lost. We had a meeting with our VP, he said something that stuck with me. ' He said he liked when when a customer called with a complaint" he could fix the problem. His fear was the customer that did not complain, the customer just moved to another company. Fidelity may have a decent brokerage acct, but their customer service is atrocious. I believe that I have experienced inappropriate, unprofessional and gender bias behavior in my interaction with Amanda in the "At Risk" department during our phone conversation initiated at 8:30 a.m. EDT on 7/6/18. I formally request that the recording of our interaction be reviewed to determine the appropriateness of her actions. I contend that she was hostile, she misrepresented and misquoted me, and she made certain inaccurate and incorrect assumptions based upon my gender. Please advise me if these means are not sufficient for a formal review and response. Please also advise me the of the status of my compliant and the status of my account at your earliest convenience. Anyways they gave me the cashier check I paid the bill that the people were paying and then two days later went to swipe my card it declined. I called and that's when they told me there were no funds and that the check was probably fake. So I called n called and spoke with god knows how how many people. They were all rude and treating me like I was nothing, I never over drafted my account I was a good customer who got caught up in some bs and which I take fault for trusting these people, however I feel a lot of this could have been avoided if the rep at my branch was straight forward and didn't lie to me about the procedure had things been explained properly I feel I wouldn't be going through what I am going through. But chase wont take my Fidelity complaints seriously, on top of that the 16 different people that i had to speak with were rude I had one nice lady who didn't cut me off every 5 sec and keep saying im sorry but there is nothing we can do. 1 person out of 16. That's horrible customer service. I get ya'll aren't going to help ok so I pay it all back n it take time, but the rudeness was not called for. Once I get this taken care of I will never deal with chase again and I would never refer anyone to chase. I went through a very messed up situation I didn't need to be talked to like I didn't care by my bank, I went to my bank in hopes for relief even if you guys had no attentions of helping me or doing anything,you didn't have to act like it on the phone. The lady Michelle was by far the worse she never got loud or anything but constant interruptions and nasty attitude was uncalled for. Even if I didn't get my money back I expected my first time being involved with fraud would have been a little bit better. I shouldn't have to deal with the fact that I got scammed and the stress of bank. Also a file was supposed to be filed, and never was. I was informed that Michelle was going to do it, she didn't and she made it very clear to me that if I filed a claim chase still wont do anything. I interviewed for a job at Fidelity recently. The security was tight and the process was pretty brutal. The entire time I felt like this was a factory type environment where they hire account reps and churn you up and spit you out. I would like to see the company take a more personal approach to hiring. Maybe that is impossible with their size? They might see less employee complaints that way. Fidelity was able to give me the right investment plan that I was looking for after retirement. Although I definitely will be looking to switch my account soon. I had contacted the executives at Fidelity and they have give me complete information and schemes that I could choose from. The only problem is I had to wait on hold for about ten minutes before I heard back from them. After I did get ahold of someone they were helpful. Not just this they have suggested other plans on mutual funds so that I could plan my retirement in a better way. I would really appreciate Fidelity for living up the their name and offering some good plans to people like me. Hopefully the corporate offices will make some changes in the way support is done to better serve their affluent customers.